Since it feels like I spend 80 hour a week nursing, I've had lots of time for reading these last 10 weeks since the birth of #4. I purchased a real paperbound book (shocker, since I'm addicted to my Kindle for one-handed reading), and I'm totally loving it. 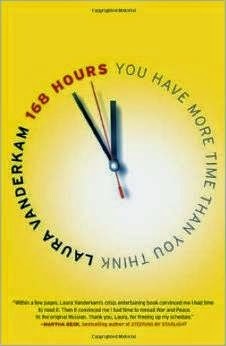 168 Hours: You Have More Time Than You Think by Laura Vanderkam is about time management, how we use our hours each week, and how to find time to "have it all". The best part for the type-A, spreadsheet loving me was the time log. It's in the book (or on her website) and you record what you are doing each hour (or half hour), every day for one week. At the end you can look back at your 168 hours and see where you actually spent your time. My biggest take-away was that I really am not spending too much time on the internet. I read a few blogs, clearly I'm not blogging myself much anymore! The majority of my email-reading and Facebooking is on my phone while nursing, pretty good alignment of tasks. I'm also reading a lot, 14 hours is about 1400 pages at the speed I read, which seems right, about 3 books per week. When on bed rest I read 33 books in 6 weeks, but I was just laying down all day! The other best part? I am getting in plenty of friends and family time. Plus I even snuck in a lunchtime sushi date with my husband in addition to talking each night and an hour with a glass of wine on our deck watching the sunset. This summer I am going to aim for even less Tv and internet, more exercise, and keeping everything else about in line.